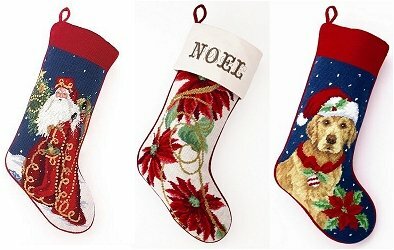 We have a wonderfully diverse group of Christmas stockings all of the highest quality needlepoint. These Christmas stockings will enhance any homes holiday decor and make Christmas Eve special indeed. Please Note- All of the stockings are finished stockings already made for you. In other words, the stocking are not kits. We don't offer a monograming service to embroider a name on the stockings at this time. Chinese production costs continue upwards this year and while we have done our best to absorb some of these we have had to raise our rates and discontinue some designs that simply became too expensive.